Andy is a semi-retired member of the research faculty at the California Institute of Technology. He studies how the genomes of marine creatures like sea urchins and sea stars dictate the form of these animals. He is past president of the San Gabriel Valley Branch of the Cymbidium Society of America and an Associate Judge for the CSA. He writes the Duffer's Corner column for the CSA Journal. He also tries to convince cymbidiums and other cool-growing orchids that Pasadena is a good place to live. One of his major goals is to introduce orchid hobbyists to the wonderful body of biological information that underlies their pursuits. 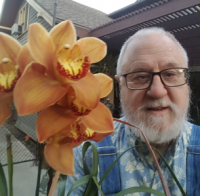 Andy's visit is co-sponsored by POS and SDCOS, thus, Andy also will be speaking to SDCOS on Tuesday, February 6 at Balboa Park on orchid flower genes. Andy will be providing the plant table consisting of plants of Tony Velardi crosses from Mariposa Gardens and some of his own cymbidium back bulbs.